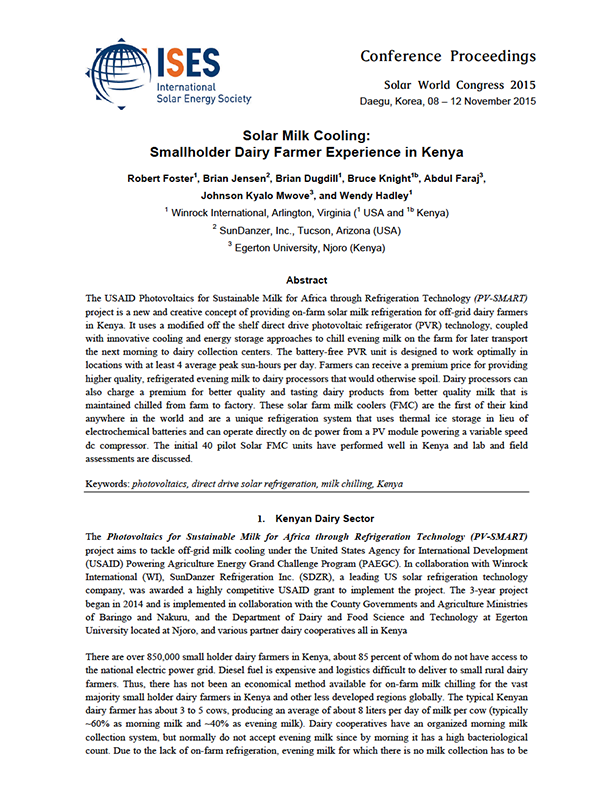 The USAID Photovoltaics for Sustainable Milk for Africa through Refrigeration Technology (PV SMART) project is a new and creative concept of providing on-farm solar milk refrigeration for off-grid dairy farmers in Kenya. It uses a modified off the shelf direct drive photovoltaic refrigerator (PVR) technology, coupled with innovative cooling and energy storage approaches to chill evening milk on the farm for later transport the next morning to dairy collection centers. The battery-free PVR unit is designed to work optimally in locations with at least 4 average peak sun-hours per day. Farmers can receive a premium price for providing higher quality, refrigerated evening milk to dairy processors that would otherwise spoil. Dairy processors can also charge a premium for better quality and tasting dairy products from better quality milk that is maintained chilled from farm to factory. These solar farm milk coolers (FMC) are the first of their kind anywhere in the world and are a unique refrigeration system that uses thermal ice storage in lieu of electrochemical batteries and can operate directly on dc power from a PV module powering a variable speed dc compressor. The initial 40 pilot Solar FMC units have performed well in Kenya and lab and field assessments are discussed.